Angels are everywhere, they're found throughout the Hebrew and Christian scriptures, they are the subjects of art and literature, and they make consistent appearances in churches, Christmas cards, and New Age gift shops. Although angels make occasional appearances in Eastern religions such as Hinduism and Buddhism, their main background comes from the monotheistic religions: Judaism, Islam, Christianity, and Zoroastrianism. All four of these religions share the tradition that there is one god in a multi-part universe (heaven, Earth, and hell) and that God's messengers between these domains are spiritual beings called angels. The angel Gabriel was said to have dictated the content of the Koran to Mohammed, angels tended Jesus after his bout with Satan in the desert and announced the resurrection to Mary when she visited Jesus's tomb. The angel Vohu Manah revealed God's message to Zoroaster, and in Judaism, angels wrestled with Jacob and guarded the Garden of Eden when Adam and Eve fell from grace. Angels began hitting hard times in the 4th century c.e., when the book of Enoch--an angelic treasure trove-- was not accepted into the canon of the church (it is in the Apocrypha), and further hard times when they were utterly dismissed by Martin Luther during the Reformation. But angels have never really gone out of style, even though they aren't heavily focused upon in theological circles, they remain in scripture, in hymns, and are referenced throughout the Book of Common Prayer. In the secular world, they are as popular as ever. They are now in television shows, and are in films as wide ranging as the classic "It's a Wonderful Life" to the sappy "Michael" to the surreal and haunting German film "Wings of Desire." They're characterized as luminous beings, as doddering nincompoops, as little cherubs on Valentine's Day cards, and as ordinary human look-alikes who mysteriously appear and disappear. In Christian and Jewish tradition, an entire hierarchy of angels was set forth, and we still use the hierarchical terms--cherubim, seraphim, angels, and archangels--without really knowing the difference. There are nine "species" or types of angels. The nine types, called choirs, are arranged in three groups of three. The highest choirs (in descending order) are the Seraphim, the Cherubim, and the Thrones. Next is the middle triad with Dominions, Virtues, and Powers. 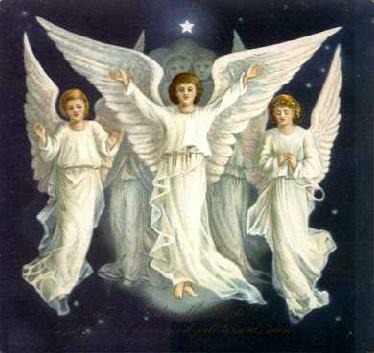 Last are Principalities, Archangels, and Angels. Seraphim are said to ceaselessly chant in Hebrew the Trisagion "Kadosh, Kadosh, Kadosh--Holy Holy, Holy is the Lord of Hosts, the whole earth is full of His Glory" while they circle God and the divine core of light. The song is said to be the song of creation, and they are said to resonate with Love. When they appear to humans (like Isaiah) it is as a six-winged and four-headed being. Cherubim are the next order. They have four faces and four wings, and they are God's charioteers and guardians. They were described by Ezekiel. Thrones are many-eyed wheels with wings, and are referenced by Elijah and Enoch. If the Cherubim are the charioteers, the thrones are the chariot. Ezekiel describes them as wheels burning like coals of fire. Dominions are channels of mercy and they regulate the angels' duties. Virtues are known as "the Brilliant or Shining Ones." They are said to bestow blessings from on high, usually in the form of miracles. It is said that they help all who struggle for good and instill courage when it is needed most. Powers are most closely associated with the battle between good and evil, and they are the guardians of our souls. Some of them--the fallen angels--become over-identified with humanity, and get to know evil too well. The Powers are supposed to keep a balance in our souls, and to help us. A fallen angel's punishment is to be banished forever from the sight of God. Principalities are an order of angels that are in charge of nations and great cities. 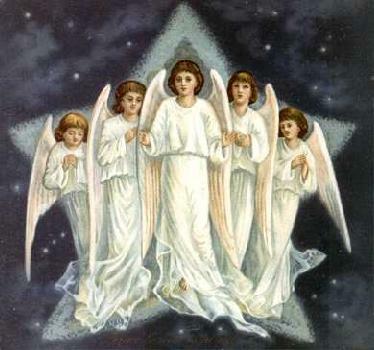 There are seven archangels, four undisputed, Michael, Gabriel, Raphael and Uriel, the other three are chosen from six candidates, depending on the religion or the source: Metatron, Remi-el, Sari-el, Ana-el, Ragu-el, and Razi-el. They are intercessors between God and humans and they command the legions of Heaven in their constant battle with the Sons of Darkness. Michael is famous for battling and beating Satan and hurling him out of heaven, and he is also known as the conductor of souls to the Last Judgment. Gabriel is the archangel of the Annunciation and the resurrection. Raphael is mostly known from the book of Tobit, he is the archangel of science and knowledge. Sari-el is the archangel who is responsible for the fate of those angels who transgress the laws, and Uriel is the archangel who brings about punishment for wrong-doers. Ragu-el is another who watches over the good behavior of angels, and Remi-el leads souls to Judgment. Razi-el is the archangel of the secret regions and mysteries. Metatron is called the archangel of the covenant, and is charged with the sustenance of the world. In the Talmud and the Targum, he is the direct link between God and Humanity. And finally, angels. They are the hoard of messengers, celestial spirits, or intercessors between the Almighty and human mortals. It is said that we each have a guardian angel when we are born, and that angel stays with us throughout our lives, urging us to our higher selves, warning us, helping us, and bringing us dreams.